Iran has asked to join Shanghai Cooperation Organization several times. Chinese Foreign Minister said that Iran’s accession to the Shanghai Cooperation Organization (SCO) can be put on the organization’s agenda once India and Pakistan work through the mechanism of accession. Iran’s accession to the Shanghai Cooperation Organization (SCO) can be put on the organization’s agenda once India and Pakistan work through the mechanism of accession, Chinese Foreign Minister Wang Yi said Tuesday. "We fully endorse Iran's interest in this issue [of joining the SCO]. At the moment, we should focus on the issue of the accession of India and Pakistan. At the moment, we need to accumulate a significant experience and create such a base. 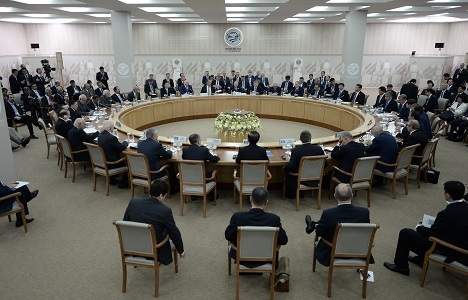 I think, in this respect, the accession of Iran may be put on the agenda of the SCO in the future," the minister said at the SCO Council of Foreign Ministers held in the Uzbek capital of Tashkent. Iran has asked to join SCO several times, the minister added. The SCO is a political, economic and military alliance comprising Russia, China, Kazakhstan, Kyrgyzstan, Tajikistan and Uzbekistan. The decision to commence the process of inclusion of India and Pakistan as member states in the organization was made during the July SCO summit in the Russian city of Ufa last year.